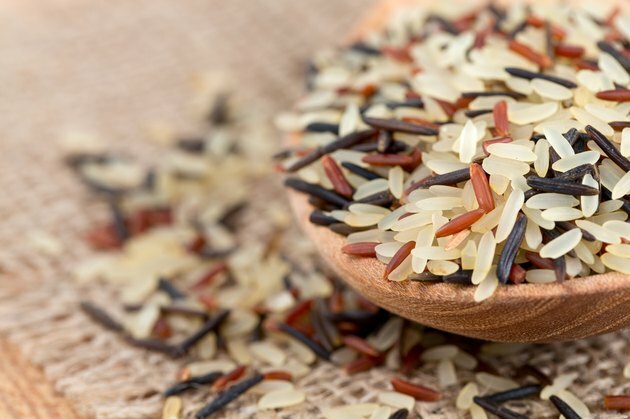 You don't have to choose either wild rice or brown rice -- they're both nutrient-rich whole grains, but you'll find some interesting differences. Three key factors to compare are their plant families, appearance and flavor. In spite of the differences, the two grains share fairly similar nutritional profiles, except that brown rice stands out as a much better source of two minerals. Brown rice and wild rice may share similar names, but they're not related -- not even as distant cousins. Wild rice isn't even rice; it's a water grass that grows wild in lakes and rivers. These different origins stand out when you take a look at their scientific names. Wild rice belongs to a genus called Zizania; since it has many different species, you may come across names such as Zizania aquatica and Zizania texana. Brown rice belongs to the genus Oryza and has one scientific name -- Oryza sativa. Both grains grow in the United States, but wild rice is harder to grow and harvest, which makes it more expensive than brown rice. Because they look nothing alike, it's easy to distinguish the two grains based on size, shape and color. Wild rice is long, narrow and a dark shade of brown. Brown rice is much lighter in color and comes in three sizes: short-, medium-, and long-grain. The long-grain version is still only about half as long as wild rice, while short-grain varieties tend to be more round than elongated. You'll usually find wild rice in mixes, combined with brown and white rice. Although they're both seeds and healthy whole grains, you could differentiate between wild rice and brown by how they taste and feel in your mouth. Wild rice has a distinctive, stronger flavor than brown rice and feels almost firm even when properly cooked. Brown rice may be milder tasting, but it still has its own unique nutty flavor and a chewy texture. Wild rice and brown rice come close to delivering similar nutrients, with two exceptions -- manganese and selenium. Brown rice has the advantage for both minerals. You'll get 2 milligrams of manganese in 1 cup of brown rice, compared to 1/2 milligram in wild rice. There's an even bigger difference in selenium content. A cup of wild rice only has 1 microgram of selenium, while brown rice has 19 micrograms. While these may seem like tiny differences, the amounts in brown rice come much closer to meeting your daily needs for these minerals. Manganese helps make a strong antioxidant that protects energy-producing structures inside cells from damage caused by unstable molecules called free radicals. It's also involved in metabolism, maintaining strong bones and helping wounds heal. Eating a cup of brown rice fills 88 percent of the daily value for manganese, but wild rice provides only 23 percent. Selenium is also vital for producing several potent antioxidants, and you need it to synthesize thyroid hormone. As a result, selenium has an essential role in normal growth and metabolism. One cup of brown rice supplies 27 percent of the daily value for selenium, while wild rice only fills 2 percent. Wild and brown rice are easy to cook, but both take a little more time than white rice. All you need to do is simmer them in water or broth. For wild rice, use 3 cups of liquid with 1 cup of rice. A cup of regular brown rice needs 2 cups of water. Both grains need to simmer for about 35 to 50 minutes, unless you buy a quick-cooking brand of brown rice. You can tell when wild rice is done because the grains burst open. All of the water should be absorbed during cooking. If you use too much water, either the rice will be soggy or you'll have to pour off water -- and also lose nutrients. Mix wild rice and brown rice together, using more brown rice than wild to make the more expensive grain stretch a little farther. Add chopped onion and Parmesan cheese, and you have a side dish. Make both grains into a healthy dish by mixing them with bell peppers, onions, cucumbers, cherry tomatoes and your favorite vinaigrette dressing. You could also add chicken or low-fat cheese for extra protein. For another tasty salad variation, combine wild rice, brown rice, cranberries, walnuts and an orange-based dressing.